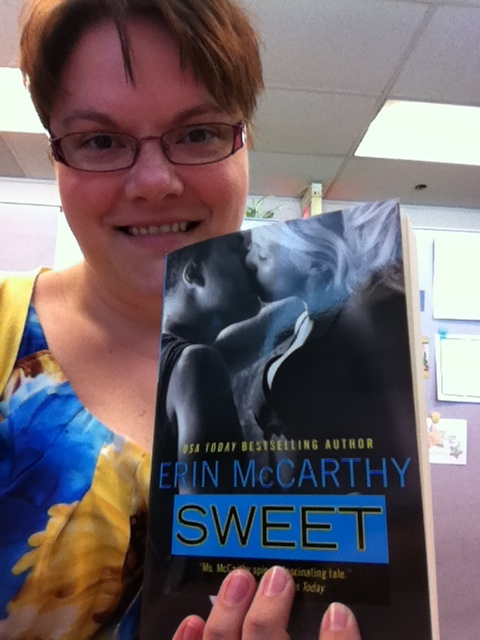 My order from amazon.com arrived today containing, among other things, my print copy of Sweet by Erin McCarthy. It’s a really good read, but that’s not why I bought the print copy. See, I already have an electronic copy and was fortunate enough to be an early reader. (You can read my review of it here!) I also read and reviewed the first book in the “True Believers” series, True. (That review is posted at On a Book Bender.) Apparently, a few words I wrote in that review were well-liked! In the opening pages of Sweet, you’ll find blurbs and quotes about Sweet, True, and other titles of Erin McCarthy. Among them, are a few words of my very own – for the first time ever! I’m so thrilled and excited to have some of my review wording be used in promoting Erin McCarthy and the “True Believers” series!